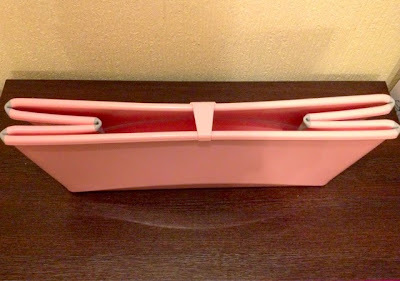 A foldable baby bath?! You might wonder why you would ever need a foldable baby bath but I can tell you, you just do! You know when you go on a UK holiday and you fill the car with all sorts of 'essentials' then you spend your whole holiday fighting a toddler into a shower just to get the sand out of their hair! Or when you are walking around your house looking at the piles of stuff you've accumulated since being a parent and you just can't find anywhere to store that big bulky baby bath so you admit defeat and it ends up taking up awkward floor space or half the dining room table! 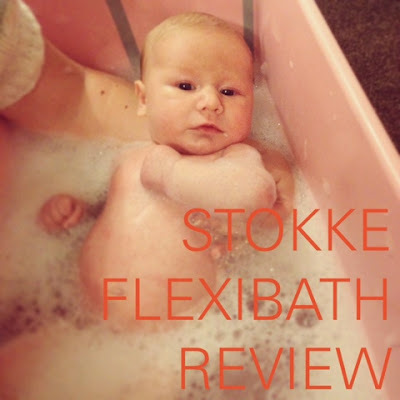 Well if you can relate you need to read all about the Stokke FlexiBath! Stokke® Flexi Bath® is a foldable baby bath suitable from birth to four years. The space saving design makes it easy to store and convenient to use at home or when travelling, encouraging more shared bath time moments. The optional Stokke® Flexi Bath® Newborn Support provides additional comfort for newborn babies. Now the FlexiBath as a newborn bath, there is a newborn support available for the bath which isn't a necessity but I think it would definitely be worth getting if you are planning to use the FlexiBath for a newborn. I haven't got the newborn support so have been using the bath without but do find sometimes Elsie slides around a lot and babies can be very slippery. She does however love the bath. She was so relaxed and loved how she had plenty of room to kick her legs around. I like how easy it is to fill up and the water seems to stay warm in it. The plug inside is great! I had a cheap baby bath with the older two and the plug area always used to annoy me as it wasn't easy to clean, whereas with the Flexibath the whole plug is removable so can be taken out and rinsed out easily. The Stokke FlexiBath is deceivingly big when opened up. The Stokke FlexiBath folds flat making it the perfect storage solution. I always liked the idea of a space saving bath, but wondered how necessary it would be. I've definitely found it to be very useful, especially with having three children now, we seem to have so much stuff around the house. With all the kids chairs and toy boxes along with baby bouncers, play mats, you get the picture! It gets to a point where you sigh in relief at anything that can be stored away nicely out of the way! 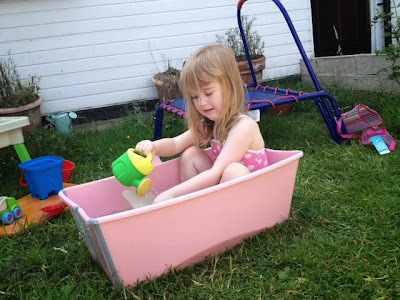 What I also like are items that have multiple uses and the FlexiBath has also been used for water play in the garden this summer and I've even seen it used at the beach, which I would never have thought of! The Stokke FlexiBath is perfect for playing outdoors. I wasn't sure about the fact the FlexiBath is stated to be suitable for up to 4 years! Looking at it you wouldn't imagine it would fit an average four year old in it. Of course having a tall almost four year old myself and still waiting for my new baby I had to test this out! 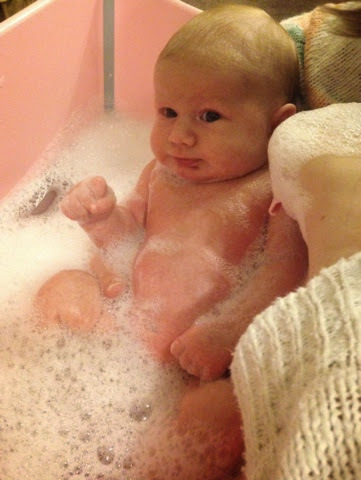 As you can see above Gracie is sat comfortably in the bath and I think the picture really shows the baths true size. She loved playing outside in the FlexiBath and I found it really practical as it saved me blowing up a paddling pool and was much easier to empty . Overall, I love the FlexiBath! It's a tad pricey but totally worth the price tag in my opinion. I do think it would be great if the newborn support was included in the price. I would definitely recommend it to anyone who is short of storage space or travels a lot as it really does fold small. 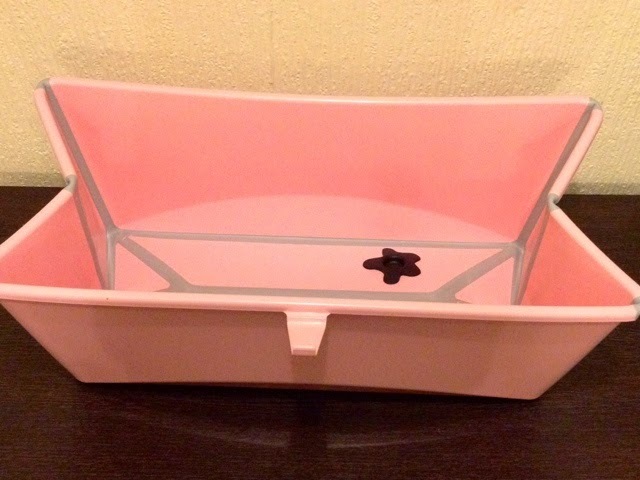 The FlexiBath has a RRP of £35 and comes in five different colour ways; Pink, Blue, White, Orange and Clear. It looks wonderful and I wish it had been around when Emmy was tiny as I had a horridly huge one, which is still in my junk room somewhere, barely used and hated. I've just given away our old baby bath I used it for both kids up until this year when we had our bath fitted. I hated how much room it took up so would have loved to have this years ago! It really is! It's so easily stored and nice and lightweight. This looks like a great solution, especially if you only have a shower or a really awkward bath! Yes! We had that problem up until this year we only had a shower which the kids hate. I really wish we had had this sooner.